This is a rectangular Petro Oil Burner porcelain sign. This particular Petro Oil Burner sign is white with red and blue print. 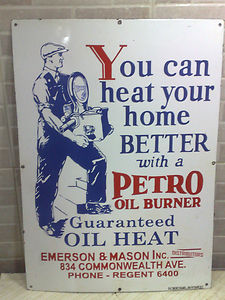 It reads, “You Can Heat Your Home Better With A Petro Oil Burner, Guaranteed Oil Heat, Emerson & Mason Inc, 834 Commonwealth Ave., Phone – Regent 6400” and features a blue man holding a Petro Oil Burner on the left side of the sign.